Probably it was just as well that Cabers were involved in a Balliemore Cup semi-final at Balgate directly after this match because it was that which probably kept their focus away from this game and, more than likely, tempted them to keep one or two of their eligible players back for the real game. Still, you take what you‘re offered and by good fortune Glen were offered and took both points. What you have to say though is that Castle Leod in early summer is a superb setting for a game of shinty. In the autumn it can be tricky with heavy turf and on the far side fallen leaves hampering the free running of the ball but with the grass mown short and not enough water in the burn to whisk the ball away off to the Cromarty Firth, it is the perfect venue. The pavilion with its verandah is something else. On a still night you could sit there like a true Victorian old India hand watching the sun go down, sipping a gin and tonic waiting with your gun until the tiger comes up to pounce on the tethered goat. Simply put, in shinty terms it is a paradise. Which makes it all the more of a pity that the Glen played like angels for only 15 minutes- and then spent the remaining 75 minutes sprachling about in search of a way to lose the match. Fortunately they were unable to find one- but that was largely thanks to Gregor McCormack at full back who managed to handle Cabers full forward Alan Ross well. Credit must also go to the two young wing backs James Hurwood and Ross MacDiarmid who both played excellently but above all at full centre Iain Macleod inspired the side and led by example, especially in these dire patches of the match when it seemed as if Cabers’ goat might untether itself and pounce on the Glen tiger, so to speak. Oh and yes, Garry Mackintosh had a tremendous series of hit outs-three quarters of the park if they were an inch; he also had a fabulous save and scored a goal so he certainly played his part. So how did the game go, Wing Centre? Unfortunately, the note book is rather crumpled because it was stuffed into a pocket quickly as Ref Sloggie sternly ordered your humble scribe and Billy Macleod to retire smartly from the back of the Glen goal where they had positioned themselves to fetch and carry balls which , having gone over the bar, were bound for the burn. However the notes reveal the following: the Glen started extremely well with good long hitting and the first chance fell to Fraser Heath but he dug the ball up and over the bar. Cabers then exerted some pressure down the Glen left flank but James Hurwood was quick to the occasion and nipped the ball away and up the line. Glen then opened their account with a well taken goal which came as a result of some intricate build up play. The move was started by Daniel Mackintosh who picked up a ball hit out of the Glen defence by Gary Smith. Mackintosh carried the ball a step or two and slipped it forward to Fraser Mackenzie who turned it in to Stuart Morrison. He found Ewan Menzies out on the left and the young wing forward fired the ball into the net past stranded Cabers keeper veteran Donald Mellis. A mere five minutes was on the clock and the Glen looked as if they were going to walk the game when Menzies hit number two a few minutes later. Cabers did fight back as one would expect them to but time and again their forward movement was halted by full back McCormack and buckshee Gary Smith. The young wing backs too stuck to their task and in the first period in particular played simple, sensible shinty getting to the ball first and moving it on with MacDiarmid catching the eye by his clean hitting and by the manner in which he had the presence of mind to slip the ball up the line when he was given the space and time to do so. At the other end chances were still coming but sharpness had gone from the Glen shooting and first Fraser Mackenzie and then Calum Fraser saw attempts go over the top. The Cabers defence played as befitted a team whose wives and mums were up in the square dressed in Victorian garb to celebrate the village’s gala day - that is to say in a Victorian manner . They stopped the ball with their feet and battered it up field: they might have been wearing knickerbockers and hand knitted socks but they kept the Glen comfortably at bay and after Glen’s Stuart Morrison had hit the side netting and Fraser Heath had done likewise, the men in blue came more and more to the fore. However it took until the 35th minute for them to have their first shot at goal. Then came a series of attacks at the Glen goal as Cabers struggled to get something from the game and twice they were thwarted by keeper Mackintosh while on another occasion the ball was neatly knocked into the net but was ruled out for offside. At half time as the Glenners queued in pensive mood for a cuppa – the fixture could yet be tricky-they swapped stories about their entry to the ground. All had a similar story. They were stopped at the gate by someone who looked as if he was about to charge them money. “I’m going to the shinty match over there” was not quite detailed enough to gain admittance. The clincher was a test question of masonic complexity. “Who’s playing?” All the Glenners the Wing Centre spoke to had known the answer and were let in. Others may well have been turned away or charged money and whisked off in a bus to the Victorian Gala day, though one doubts that MacBrayne’s Buses, however old they may be, were ever in vogue in the days of the Queen –Empress. The second half saw Glen pick up a little and a nicely worked ball from a free hit was laid back to Iain Macleod and he narrowly missed the Cabers goal from distance. A further piece of interplay saw Ewan Menzies play in Fraser Heath but the youngster’s shot was blocked by the ever green Mellis in the goal. The game stuttered on for an extended period in a similar fashion but with Cabers emerging as a force more and more. Fortunately it was late in the day when Cabers winger Arran Ross picked a ball out on the right wing and fired it into the goalmouth where it took a wicked deflection, hit Garry Mackintosh’s leg and popped into the net. Cabers were back in the game-only they weren’t because there wasn’t enough time left on Granddad Sloggie’s clock for them to get back in properly and by then the cheers of the Cabers fans were muted as most of the die-hards were getting ready to head off to Kiltarlity where their big team were to book a place in the Balliemore final by 20 past 4 that same afternoon. So then Glen shook hands, picked up their kit and went off to Kiltarlity too where they saw Beauly play silky interpassing “Glen style” shinty – but they lost. Perhaps the Victorians got some things right: after all they did have an Empire. 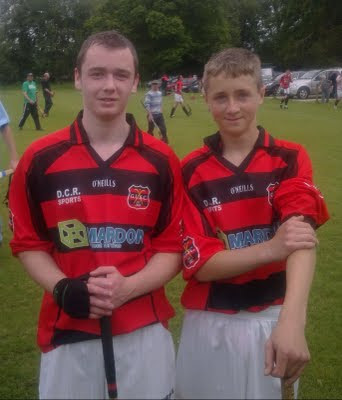 The picture is of wingbacks James Hurwood and Ross MacDiarmid : they both played well enough to merit a snap. When Two Glens go to War……..
Have Hendo’s Heroes finally turned the corner?